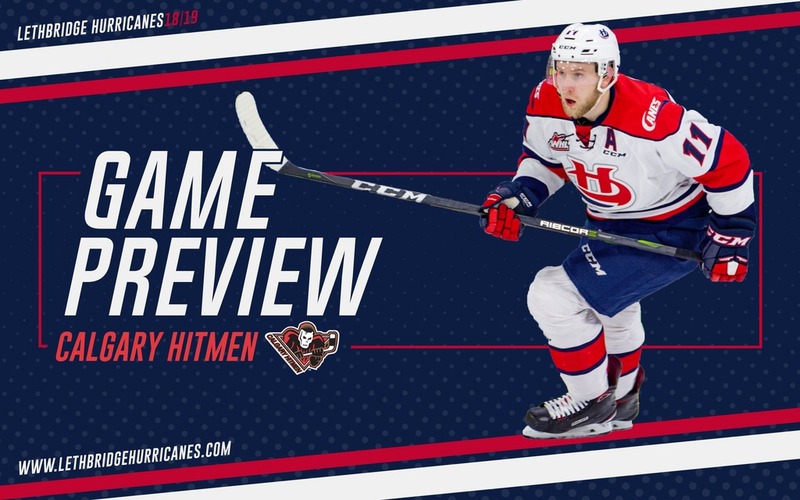 Lethbridge, AB – The Lethbridge Hurricanes end a season-long six-game homestand tonight as they welcome the Calgary Hitmen to the ENMAX Centre at 7:00pm. The Hurricanes (27-1-6-5-5) are riding a three-game losing streak after suffering a 6-5 loss on Saturday against the Prince Albert Raiders. Jake Leschyshyn scored twice while Jake Elmer, Ty Prefontaine and Igor Merezhko scored the goals. The Hurricanes are 2-1-1-1 in the five games on the homestand. The Hitmen (28-20-4-1) enter having earned a 6-2 win over the Moose Jaw Warriors on Sunday at Scotiabank Saddledome. Six different goal scorers lit the lamp for the Hitmen in the victory. Calgary enters tonight three points behind the Hurricanes in the Central Division standings. Tonight will be the fifth of six meetings on the year between the Hurricanes and the Hitmen; Lethbridge has posted a 3-1-0-0 record in the four games prior having won the last three. Tickets for tonight’s game are available online at www.enmaxcentre.ca, by calling 403-329-SEAT (7328) or by visiting the ENMAX Centre or Yates Ticket Centre’s. VS. HITMEN: Tonight will be the fifth of six meetings on the season between the Hurricanes and the Hitmen. The ‘Canes are 3-1-0-0 in the previous four games this year while having won each of the last three by a combined 17-12 in those three games. The two teams have not met since before the Christmas break.